The proposed Fundraising Preference Service is doomed to fail and could simply become an unnecessary overhead that will undermine the sector further. Policy makers through to practitioners need to rethink this proposal urgently. Here’s some practical reasons why. Let me first clear up where I stand on this issue. The voluntary sector has thousands of wonderful people often working long hours for nothing, or on low pay, providing services to the people of this country which have increasingly replaced vital public services and are frequently undervalued by both the public and the service recipients. But all is not rosey with this sector by any means, and it does need to be sorted to retain public confidence. We owe that to staff and volunteers in the sector, but more importantly also to funders and donors and ultimately to the beneficiaries — customers and/or clients. Any sector that forgets that its main purpose is to benefit its customers has totally lost the plot. I’m someone relatively new to the sector though I’ve had experience now as a director, volunteer and trustee. Being newish, I’ve made an effort to try to catch up on lost ground by reading widely, engaging in social media, and attending charity events, and my comments don’t necessarily relate to organisations I’ve personally been involved in. What I lack in experience over those who have always been in the sector I hope I compensate with new insight. Part of that insight comes from many years working in central government communications. That included projects such as The Community Charge (you will know it as The Poll Tax), and The School and College’s Performance Tables, both highly visible and controversial campaigns. For the record, I sat at the Department of Environment and tried to convince them in vain that the Poll Tax would be highly controversial and was told I was talking rubbish. Afterwards I was promoted for my work on The Poll Tax and the Prime Minister, Margaret Thatcher, was sacked, so perhaps I was not talking so much rubbish after all! But group think had taken hold on this project and most of us who could see it was going wrong were too far down the food chain to be listened to. And that’s where this proposal will fall down. If you’ve followed this far, let me proffer some more ‘rubbish’ advice. They lack the strategic and management skills, they lack the systems, they lack digital skills and are stuck in the digital dark ages. Charities need help getting up to speed, not beating over the head because they are not. There is no shortage of bodies serving the sector, that is part of the problem — there is an overwhelming number of bodies and no trustee or member of staff could ever hope to keep track of them all, nor pay all the membership fees they demand. It’s time for a bonfire of the overlapping voluntary sector bodies, so funds are not sucked out by these external overheads. Many charities are not just charities they are also companies, meaning they have to straddle two sets of regulatory regimes. Yes, there is a lot of overlap, yes there are new charity models to try to overcome this, but changing is a burden in itself when you are often relying on volunteer and sometimes amateur trustees and pro-bono professional advice or professional advice you simply cannot afford. Charities don’t need more regulation they need smarter, slicker regulation. It’s not deliberate, but there are massive differences between large charities, some with relatively well paid, well qualified staff in plush central London offices and the many smaller ones work in Dickensian offices (or from home) with few or no staff, or staff who are attempting to cover roles way beyond their experience and skills. The smaller charities can’t compete, and donors and funders are increasingly being sucked into funding the larger charities. Ironically the recent controversies in the sector have nearly all been around larger charities but it is the smaller ones that will also now be hit with a public loss of confidence. Smaller charities don’t need more burdens, whether imposed directly by regulation or by being caught up in sector wide reputational damage. There’s the fundraising vicious circle: ‘we need more staff, therefore we need more money, therefore we need more staff to raise money’. There’s this mad game of trying to impress donors/funders that ‘100% of your money goes to beneficiaries’. 100% is impossible if you really understand how to cost overheads. And if you do try this route you can quickly fall into under-investment in training, IT and other systems that simply means the charity is using resources inefficiently. Charities need to run in a business like way: that means keeping close control on overheads, but not to the point that you don’t invest to stay efficient. Value for money is more important than ‘cheap’. Trying to outbid each other in a race to the bottom helps nobody. Large charities can be expected to have paid marketing and fundraising staff, but small and medium ones frequently rely on volunteers or trustees and have little or no budgets for marketing and fundraising and little in the way of strategy. Websites are expected to be free and magically run themselves. Social media doesn’t need a strategy or any understanding of copyright, defamation, search engine optimisation … just yank in a ‘young person’ from the street — call them an ‘intern’ if you want to sound posh and think you can get away with not paying them — and sit them in a corner posting on Facebook all day and your social media marketing is done! Does that sound familiar to anyone? Charities of all sizes need to take marketing and fundraising seriously. They are strategic functions needing professional skills. That may even mean paying for some services in the way you would pay for an accountant or solicitor, your manager/CEO, outsourced HR services, IT services. There’s already a Mailing Preference Service, Baby Mailing Preference Service, Telephone Preference Service, Fax Preference Service, Your Choice and Telephone Preference Service Assured. How many consumers want to have to register with yet another service? Why can’t they all be merged into a single registration where you opt for the services that affect you? How many of the charities who caused the recent problems were cleaning their mailing lists against all these services? Would they take notice of another? There’s also the Data Protection Act and 2003 Privacy and Electronic Communications Regulations (PECR) and plenty of good advice from the ICO, not to mention advertising standards and others. I’ve been horrified by how many people I’ve come across in trustee, senior management and marketing and fundraising roles who didn’t know about these regulations, or thought they didn’t apply to the sector. Good marketers do follow the regulations and anyone who has followed them all to the letter is unlikely to be the sort of professional who would harass potential donors — true marketing professionals value their customers and don’t annoy them. It’s the rogues that ignore regulations. And rogues will probably continue to be rogues. Or it’s leaving the job to volunteers and not training and managing them properly which can cause problems. More regulation will not work if you don’t raise the professional standards in the sector. And if you do raise professional standards you shouldn’t need this sort of regulation, other than as a backstop for extreme transgressions. Cleaning mailing lists is not easy nor free. Take this example. This is typically what you might get if you clean mailing lists. How many Mr Smiths are there? There could be one or up to six. There may be a father and son with the same name. One address may be a work address, one a home address. Mr Smith may have moved and not updated his details with the charity or Preference Service. And of course a ‘B Smith’ or ‘W Smith’ could be a Ms/Mrs too if not title is clearly identified! You’ll also see in records four, five and six that the same address can be recorded in different ways. The Royal Mail relies on the Post Town, but there are also administrative counties and historic counties (eg in area where there is a unitary authority). The format of address used can depend on the individual’s preference and/or the system constraints when completing an address form. Romford hasn’t been in Essex since 1965, but it still frequently appears in addresses. People also have multiple email addresses and multiple phones numbers. The huge number of potential inconsistencies can make address cleaning very complex and unreliable. Inputting can simply be inaccurate — by the individual themselves or by a member of the charity’s staff or even more likely where volunteers are used. However accurately the data has been input there can be errors in analysis — in record five there is apparently no postcode, but it is just in the wrong column. But if you sort by postcode on eg Excel or a database that record won’t come up. In record four, someone has interpreted ‘Title’ as ‘Job Title’. Poor field definition is a common mistake, and if you are using volunteers who have limited familiarity with your inputting rules it’s very common. These sort of errors are common in address management everywhere, even on sophisticated government systems. They are particularly problematic in organisations using spreadsheets, rather than structured databases, and getting data in from external services such as online giving sites where you cannot configure the field format yourself. The Fundraising Preference Service would be collecting data from across a number of charities. To have a reasonable chance of individuals being reliably identified in all their different potential guises, every charity using the FPS would need to run robust address management systems with a high level of consistency across the sector in how addresses are held. Read on to see why that is simply not going to happen. Does your charity map all the systems where you may hold personal data? Have you thought of all the places you may hold address data? You should have done this already to comply with the Data Protection Act, eg if you get a subject access request, or a request to ‘delete my data’ or never contact me again. Where you hold personal data isn’t restricted to sophisticated software. It can include bits of paper, spreadsheets, Word documents, Post-it notes or whatever other horrible methods you’ve fallen into. There could well be more, especially if you have volunteers and trustees with their own lists (raffle tickets, coffee morning? ), maybe on home computers. You have? Or you don’t know? You’re almost certainly breaching the Data Protection Act already! Before anyone gets too sanctimonius, I worked in part of government where we were about to send five duplicate letters from the CEO equivalent to the Secretary of State because address data had been spread about the organisation in all sorts of unofficial pots and there were no de-duplication procedures in place. Which is why cleaning lists fully to meet the requirement of any of the preference services is so easy to propose and so difficult to do. If the Telephone Preference Service and Mailing Preference Service were so effective, why are so many people, me included — and I’m registered with both — still plagued by junk mail and constant nuisance calls? Either because the rogues just ignore these regulations, or because even the best intentioned people find compliance just too difficult and get it wrong. Finally, don’t get me on differentiating between Ministers at their Departmental office address, the House of Commons, their constituency address and any one of their homes and correct titling of members of the House of Lords! Just see some of the links at the bottom of the page if you want to turn into an address management geek. This proposal has all the hallmarks of those making policy failing to consult with and understand the issues at the coalface. That’s common in policy making and is a subject discussed in the excellent book by Anthony King and Ivor Crewe The Blunders of our Government, which should be compulsory reading for any aspiring minister or policy maker in any organisation. The chapter ‘Operational disconnect’ is particularly pertinent. The proposals for a Fundraising Preference Service, I’m sure, are well intentioned. 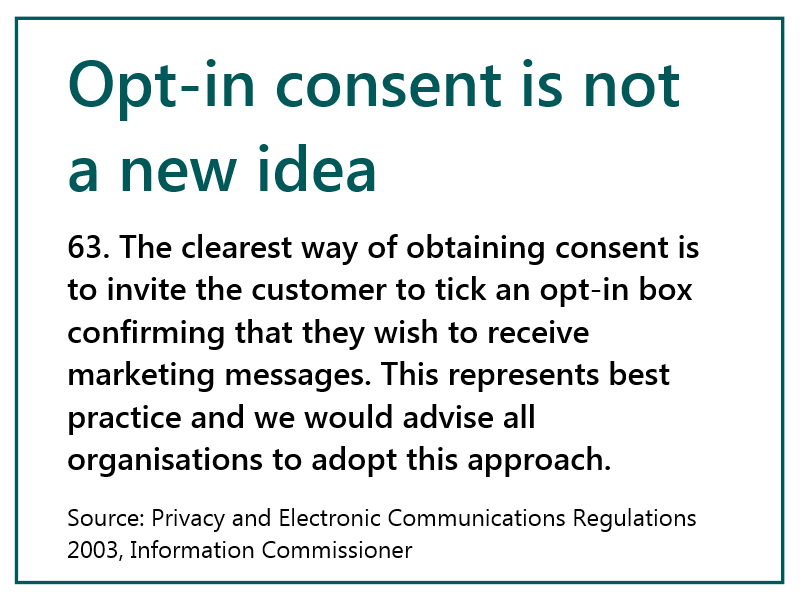 But for all the reasons that the Telephone Preference Service and Mailing Preference Services still keep Ofcom and the ICO busy, it seems like a typical policy knee-jerk reaction to the demands that ‘something must be done’. It will not solve the problem, but it will involve many charities in a lot of extra overheads. The real danger is that people will assume it can fix the problem and lead to complacency in the sector and the underlying problems will get kicked into the grass. The other danger is that it will also lull the public into a false sense of security which could come back to bite politicians and the higher echelons of the voluntary sector in years to come. Bash the few who have caused this problem — but don’t bash the many who are innocent. Donors are rightly disgusted with the rogues. The good guys in the sector are disgusted with them too.